"Pollution of the Realms" is a mod that introduces blocks of carbon and sulfur emissions from the combustion of various fuels. These blocks are created around fuel burning sources, rise into the air and accumulate in the clouds. If unchecked, they will affect plants, animals and players in several ways (see "Negative effects" below). This mod introduces the problem of environmental pollution and encourages modpack makers and players to seek various paths to mitigate the consequences. There are methods provided within the mod itself to do this, but the intent in designing the mod was to encourage flexible solutions when combined with other mods. For best results, use with Advanced Chimneys. You can clean up the pollution with a special tool - the vacuum tube. There's three types of vacuum tubes: iron, golden and diamond, that perform better as one would expect. Note that emissions can't be stored in the inventory (you wouldn't want to get all your stuff smoky and gunky, would you? ), so a vacuum bag will be required, with similar capacity upgrades per material. Put on the bag and take the tube in your hand. Aim at the pollution blocks, and hold the right mouse button to vacuum-clean. Crafted vacuum bags are equipped with a sulfur filter that can be refreshed on an anvil using wool. Additional filters for carbon or dust can be installed using leaves or paper. As pollution levels increase, harmful effects will grow as well. To protect yourself, you may need to craft a respirator (each type has a different durability). Crafted respirators are equipped with carbon and sulfur filters. Dust filter can be installed on an anvil using paper. Note that a vacuum bag or respirator picked from the creative inventory provides no filters, so you have to install them manually. The same goes for respirators from compatible mods. To prevent sulfur emissions from entering the atmosphere or the greenhouse, place the wool filters on the top or in the middle of the chimney pipes. 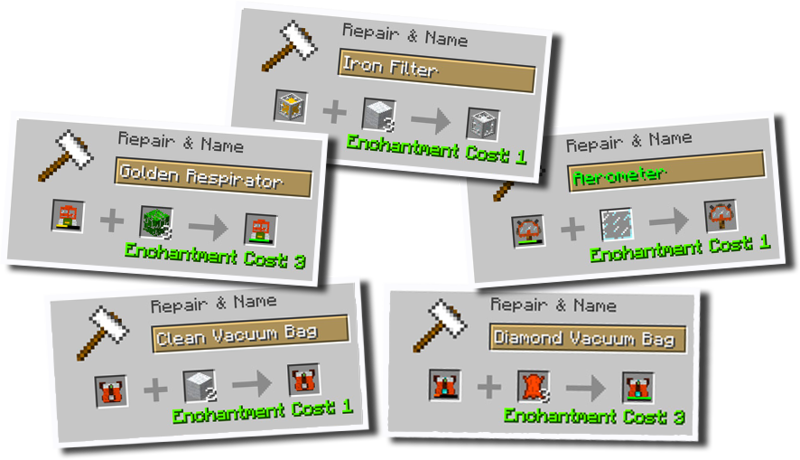 You can also upgrade the filter to cope with carbon and/or dust on an anvil using leaves and/or paper. You may also need an Aerometer to check the pollution level of the chunk you are in. Special care should be taken if you place the source of emissions within a confined space, as this can lead to suffocation or even an explosion. To prevent fatal consequences make sure of providing a good ventilation, using chimneys, vents and pumps. Every pump could maintain 4 independent ventilation lines up to 16 blocks in length each (connected from the side) and one chimney pipe (connected to the top). As a last resort, you could push emission blocks with your hand (more efficiently, holding some item) towards the way out. 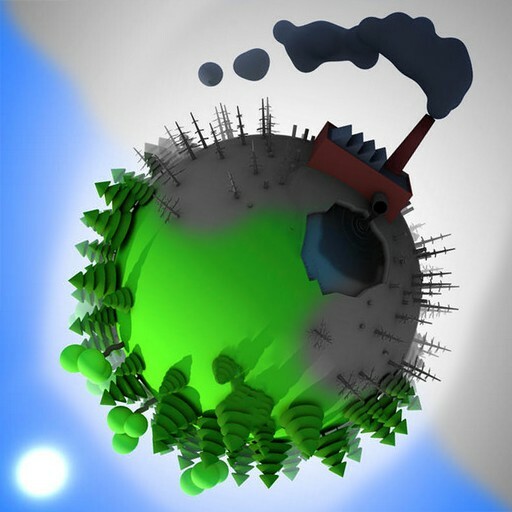 Despite the fact that carbon emissions are poisonous for animals and players, they are vital for plants, as they absorb carbon during photosynthesis to take energy for growth. You can benefit from that by planting crops in areas contaminated with carbon, or by building greenhouses and pumping carbon into them. To prevent spread of emissions around the furnace, you can place chimneys next to it. You may need to place additional chimney pipes if your furnace generates too much emissions. If the chimney is covered by solid block and emissions have no way to go, they will accumulate and subsequently explode. Feel free to use the mod in any modpacks. You are allowed to use it without asking for permission. Is there a way to change the effects applied by a pollutant at concentration, or to add a custom pollutant with specific effects at different concentration levels? I don't see a way to do this by looking at the default configs. Everything has been added in version 1.0.7.0. Thank you for the translation! Could you put it under the spoiler? P.S. To get polluted water, you need a chunk that is contaminated with sulfur above 5% and rainy weather. Sulfur emissions that fly over water will pollute it. OK,thanks can you add acid rain too? Hi. 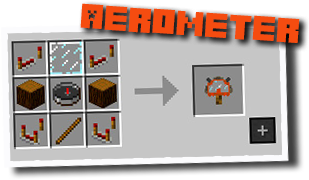 Can you make buildcraft oil engine make Carbon. Are you planning to add immersive vehicles support? Hi. I was wondering if you were planning to add support for thermal expansion's dynamos to produce pollution? I set all the pollutants to NOT grow grass, but it still does. Can anyone help me? Only carbon can grow grass. Have you made changes to the configs from the "Pollutants" or "Biomes" folder? There is a chance that your grass was recognized as a plant, if some mod has overridden the vanilla stuff. Try setting the canAffectPlants to false and see if that helps. It seems to work, thank you! Now I'm wondering what kind of grass do you have and in what biome, so that it can't be correctly identified? Yes, the world and the mods list would be very helpful to solve this problem. Thanks in advance! There is a way to have infinite filter? Infinite, no, but you can significantly increase its capacity through the config. Could i create an integration that add this feature or could you create this?